There were two clear winners in the CNN/Salem radio debates and one clear loser. I thought all but one gave good performances and I salute all the GOP candidates. The two winners gave concise clear strong answers all night long. They were confident and gave informative and authoritative answers. Those two winners in my opinion are Senator Marco Rubio and Carly Fiorina. These two, along with Governor Jeb Bush seemed to me like the audience favorites. Listening now to the talking heads and the focus groups, it seems like a consensus is building that Carly Fiorina is the clear winner. The one clear loser was Donald Trump. He gave his usual insubstantial meaningless talking points. But worse than that was his juvenile faces he was making when other candidates were talking. The best line of the night and the one that got the biggest ovation was given by Carly Fiorina, after Trump had just basically told Governor Bush that words have meanings. Carly was then asked what she thought about Trump saying, "look at that face, who would vote for that face?". 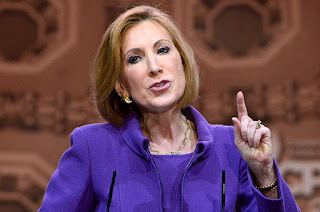 Carly then responded, "It is interesting that Donald Trump just told Mr. Bush that people had heard what he said. Well I think the women of America clearly heard what you said, Mr. Trump." To show how prescient the Tales is, before the debate I had predicted that Carly Fiorina would win. You might be thinking, oh, I can say that now...but how do you know I really said that. Ah, my friends I have proof from a tweet that was read by @GretchenCarlson on #TheRealStory.